The Masters of the Universe line is as popular as it ever has been with a brand new toy line and a super cool cartoon to boot. Of course, with every popular toy line is some sort of exclusive to reward (or infuriate rather) the most serious of collectors. The ever entertaining ToyFare magazine was given the glory of offering the exclusive Faker, Evil Robot of Skeletor. Earlier ToyFare exclusives last for a good while, but the Faker figure sold out like hotcakes. So for those still looking to order this figure, the window is now closed. 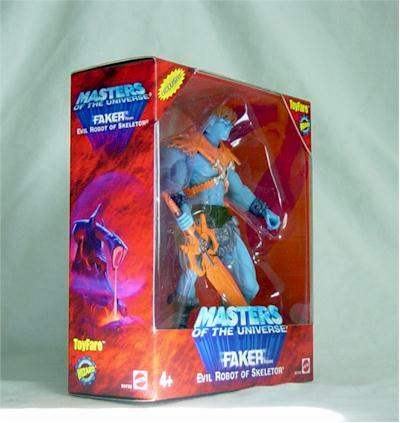 Everyone who knows what the packaging of MOTU figures and vehicles look like should rejoice, as the exclusive box made for Faker is given the same treatment. There's a nice large window on the front for viewing and we are reminded five times on the box that we are enjoying a ToyFare exclusive. The back of the box shows the specs of Faker, much like the other toys. There's even images of Snake Mountain on the sides which I thought was a great touch. Carded/boxed collectors would enjoy all aspects of this exclusive while those who open their toys can celebrate for there are no twisties holding Faker back from duking it out with He-Man. 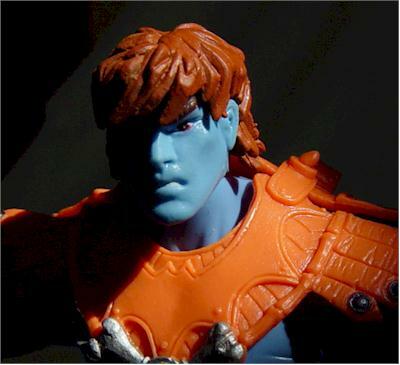 Since Faker is just a repainted He-Man, there's not much of anything to say about the sculpt. The Four Horsemen did a terrific job on He-Man, so I guess you can say they did a bang up job for Faker as well. 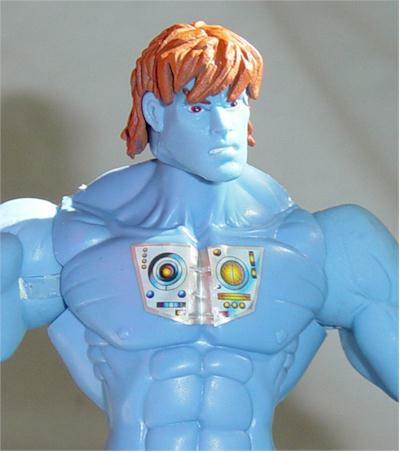 The reason Faker doesn't get a full four stars, however, is BECAUSE this is a straight up repaint of He-Man. It would be nice if there were some differences in the sculpt to make it more impressive but since the vintage figure was done the same way, I can't complain. The paint is nicely done, as you'd expect. All details in the face are well executed and there isn't any sign of inaccuracies. The one disappointment lies in the orange armor... it's just very... orange. 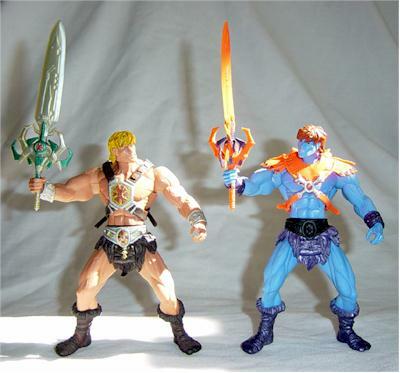 All other MOTU figures have enhanced colors from the original figures while Faker almost replicates the old look exactly. 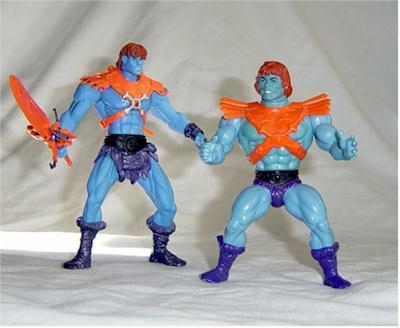 Just like the He-Man figure and many others, Faker has twelve points of articulation. There's the usual neck, two in each shoulder, wrist, waist, and two in each hip/leg. The waist articulation is also the same as He-Man's, with the slash and punch action gimmick. Now here's the area where FAKER has one up on the heroic He-Man. 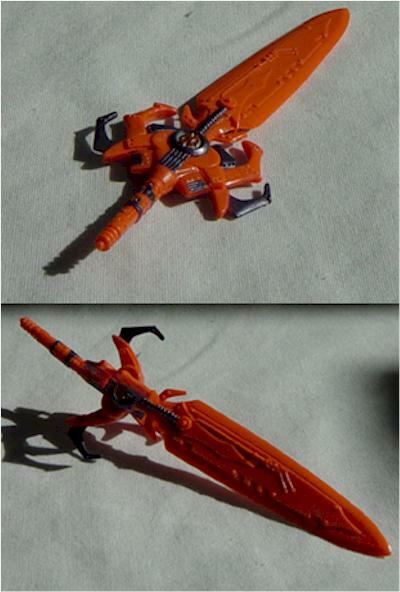 While He-Man's sword is very "flat", Faker's has a rotating action making it visually very awesome. 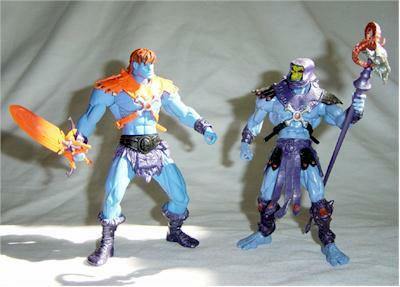 The removable chest armor is a repaint of Skeletor's and separates into two pieces. A somewhat hidden extra is a sticker on Faker's chest showing robotic gizmos and what not. A nice little touch to show that Faker is just a machine. EDITOR'S NOTE: It's been pointed out that the regular He-man sword also rotates. 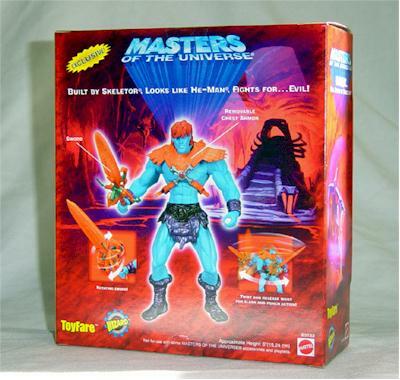 MOTU figures are usually around $7.99 or $8.99, but this boxed Toyfare Exclusive was around $15-17 including shipping. While it's close to double in price, it isn't bad considering that the packaging was so nicely done. Also knowing that it's not going to be sold anywhere else, the price was well worth it. Overall, the Masters of the Universe figures are among the nicest figures sculpted today. Faker is a must have for all fans of the series. A great looking box with a great looking figure... you just can't go wrong with a character that's built by skeletor, looks like He-Man, but fights for.... EVIL! ToyFare magazine WAS the place to buy, but the only places now would be collector stores and EBAY. Coheteboy collects almost every popular toy line and can be found in and around www.deathstarplans.com creating action figure comics, dioramas, and graphics.